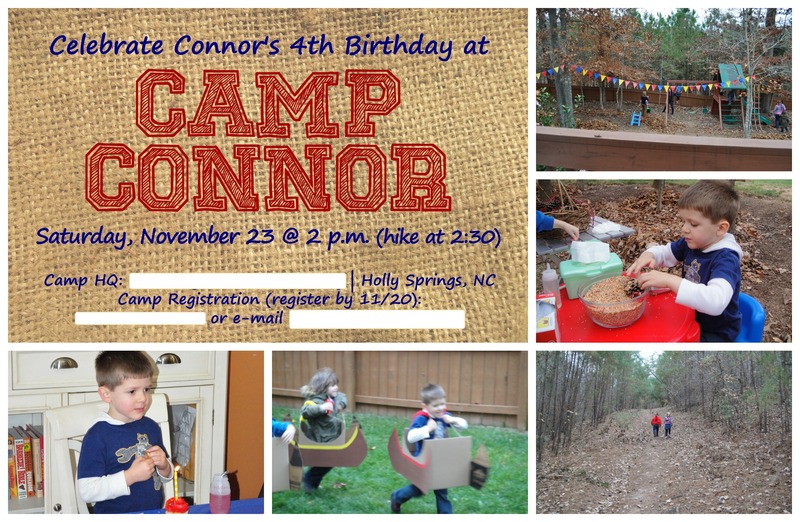 Last November, we celebrated my son’s fourth birthday party and we had so much fun. Fun. I keep using that word, and it makes me sound lame, but it was pure and simple fun. I’m not sure how I pulled off taking a bunch of four-year-olds into the woods, letting them play on a rickety foot bridge over a creek, and then turned around and let them have pointy sticks and be close to fire, but I did – we all did. Not only did we survive, but we had a great time. ‘Camp’ is a pretty unusual theme, but it just made sense for us. 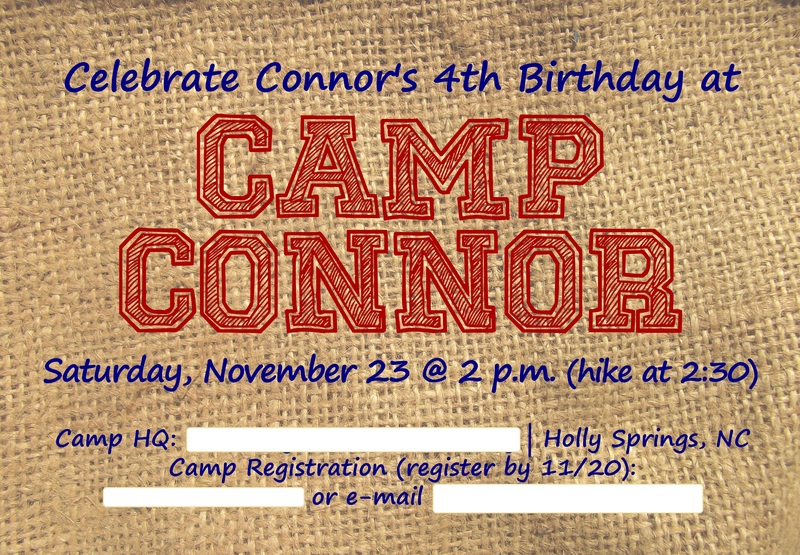 One of my son’s favorite things to do is go for a hike in the woods behind our house, and he’s been asking to go camping for months, so it seemed like a no-brainer to make this his birthday. I have to say, this party was a lot easier than I thought it would be. This is why I’m posting about it – at the end of the day, after everyone had gone home, I looked around and said “Man that was fun!” It didn’t cost a fortune, we all had fun, and I was able to enjoy it just as much as my guests. It was so much easier to host a full-blown kid party than I thought it would be. I kept the invitation simple – just a burlap background with simple writing on it, and printed at the drug store one-hour-photo lab. You can read more about my invitations in this post. Party day came, and we were so excited! We hung primary color bunting across our back yard and our front porch, and covered tables and our kitchen island in primary colored table cloths (the plastic ones for easy cleanup). Can I say one thing about the plastic bunting? It was actually the inspiration for the color scheme, mostly because it was $1 for a nine-foot length. We bought 5. They are still hanging in our backyard and I love them. It’s giving color to my otherwise winter-gray backyard. And I’m probably annoying my neighbors so, BONUS!!! Just kidding, I love my neighbors, and I’ll take down the bunting once there’s some green in the yard. 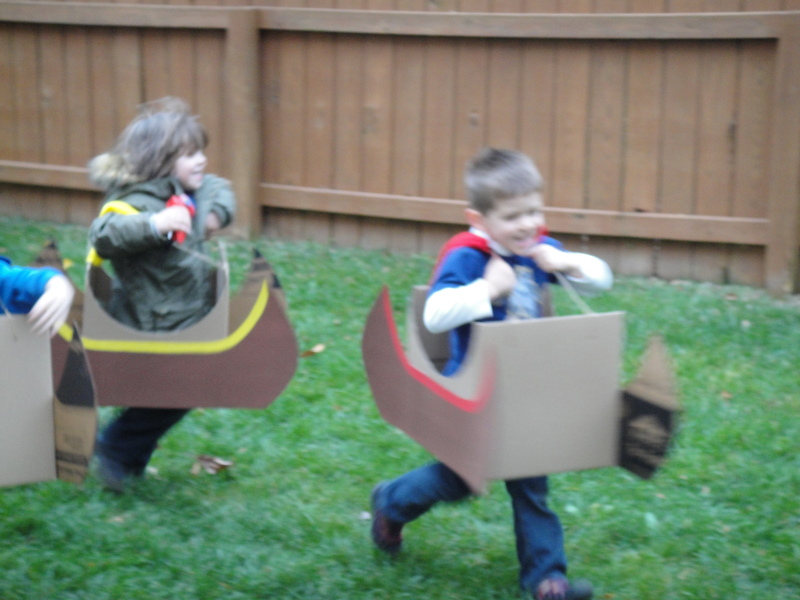 First, my favorite: These canoes made from cardboard boxes were so cute and fun. The kids had a blast racing and running around. We sectioned off our side yard by hammering some 50-cent dowels into the ground and hot gluing some blue plastic table cloths to them to create a ‘lake’ area. Ideally, I would have filled the area with blue balloons, but a couple of our guests abhor balloons and the popping noise, so I was nice and refrained. A camp party planned by yours truly would not be complete without a craft station, right? Surprisingly, it was a big hit! 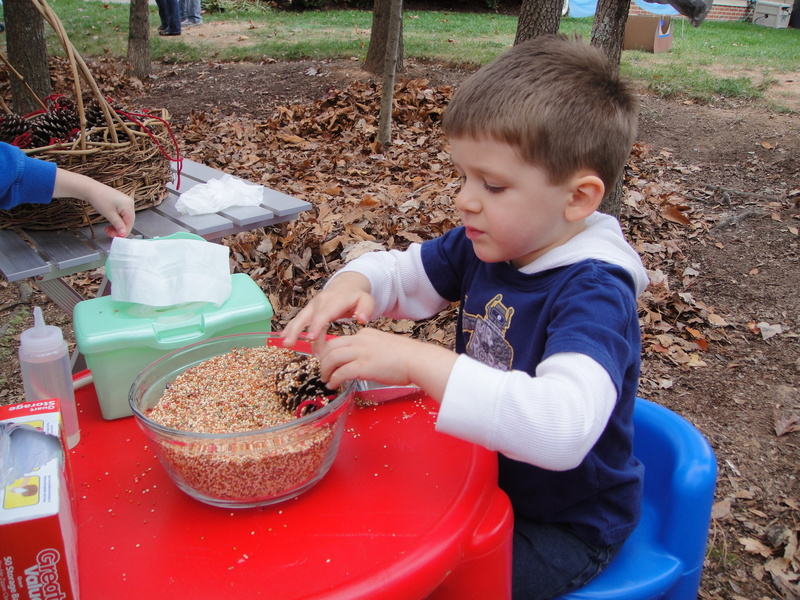 We made pinecone birdfeeders, and it was really easy to set up. My son and I foraged in the woods for pinecones a couple of weeks before the party. Then, I tied some yarn from my craft stash to them so that the kids could hang them. I set them up in a basket with a squeeze bottle full of corn syrup, a bowl of birdseed, a box of zip top bags so the kids could have something to take them home in, and a box of wipes for cleanup. The kids squirted corn syrup on the pinecone and scooped birdseed over it so it would stick. The whole thing cost $6, and I have a ton left over. Normally, they’re done with peanut butter, but I wanted to avoid any allergy issues. We also set up what we called ‘marksmanship’ which was really just a bean bag toss game that we had that we tied between two trees. To round off our camp, we set up some sports equipment, and of course, the playground was available. I didn’t schedule the activities. I welcomed everyone, and they were all free to play and go from station to station as they pleased. After we played for a little bit, we took the kids on my son’s favorite hike down to a stream and let them play in the woods for a little bit. My son loves hiking in the woods behind our neighborhood. 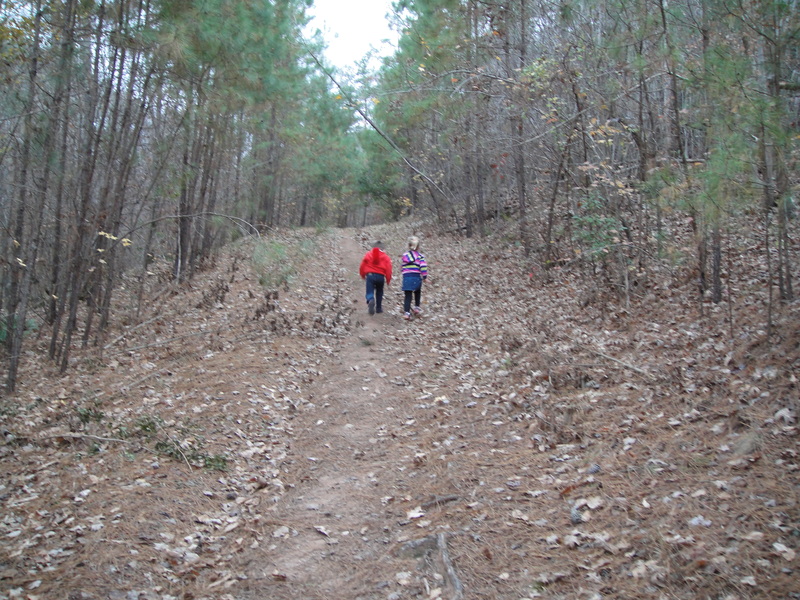 It was so cool to see my son, who can be shy at times, be so proud and comfortable as we hiked down the trails. I had planned to just go to the stream, but the neighborhood kids know the area well and all ran down the stream to a cracked, rickety footbridge, so all the kids followed down and we spent most of our time with our hearts in our throat waiting for a kid to fall in the water and/or the bridge to fully break. But nobody did, and the bridge survived. And I think the kids loved it. After the hike, we headed back to the house for hot dogs (super easy prep: baked in the oven at 350 in disposable roasting pans until heated through, and then kept on the warm setting until needed), chips, cupcakes (store-bought! ), and my favorite part of the whole night: the s’mores bar. Y’all. 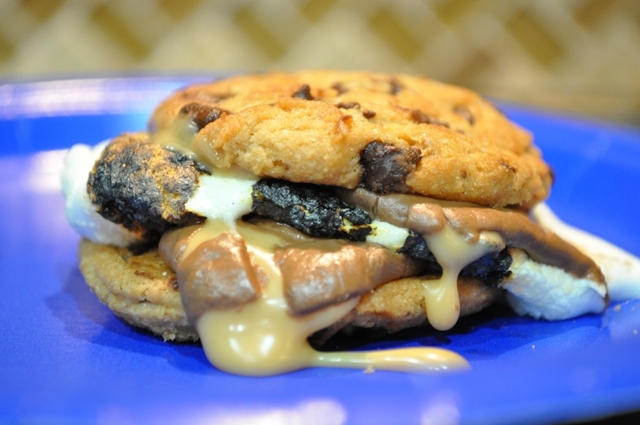 We need to talk about this whole ‘s’mores bar’ thing. I’m here to tell you to think outside the graham. Somewhere in my planning, it struck me that it doesn’t have to be graham crackers. I started to think about different candy and cookie options. Why only grahams? Why only plain chocolate? And then I had to go for it. I had graham crackers, chocolate chip cookies and shortbread cookies. And for the candy, I had regular chocolate, snack size peanut butter cups (not the small ones that are sold in a bag, but not the regular size you’d get at the candy stands in the checkout line) and rolos. I could have gone crazier. I thought about having sliced bananas, strawberries, nutella, sprinkles to dip them in… but it was a camping-themed party for four-year-olds, and I went simple(ish). Confession: I was so wrapped up in the party that I forgot to take pictures of the s’mores bar(and pretty much everything else), so I totally made myself a s’more just so I had a photo for this post. We all suffer for our art, don’t we? Setup couldn’t have been easier. I just set everything out on my countertop, lit a couple of sterno fuel cans, and said “Everyone, enjoy!” And they did. You know how a lot of parents normally don’t try cupcakes at parties and act all like “Oh, I’m too grown up for that. I’ll let the kids enjoy.” ? Well, they won’t pass up a s’more bar. This was such a fun and easy party, the way all parties should be. And the best part of it was that my son had an awesome day. Before I wrap this up, I want to thank the ladies at All Wrapped Up Parties for this awesome post about why you should consider hosting a party at home, because it got me to finally click ‘publish’ on this post. As I read it this morning, I was fist-pumping in the air going “AMEN SISTAHS! !” So thank you, Julia and Alexis! This entry was posted in birthdays, celebrations, family, kid stuff and tagged 4th birthday party, birthday, birthday party, boy birthday, camp party, camping party, kid party on February 19, 2014 by aliciamariel. Get ready for a picture-intense post. 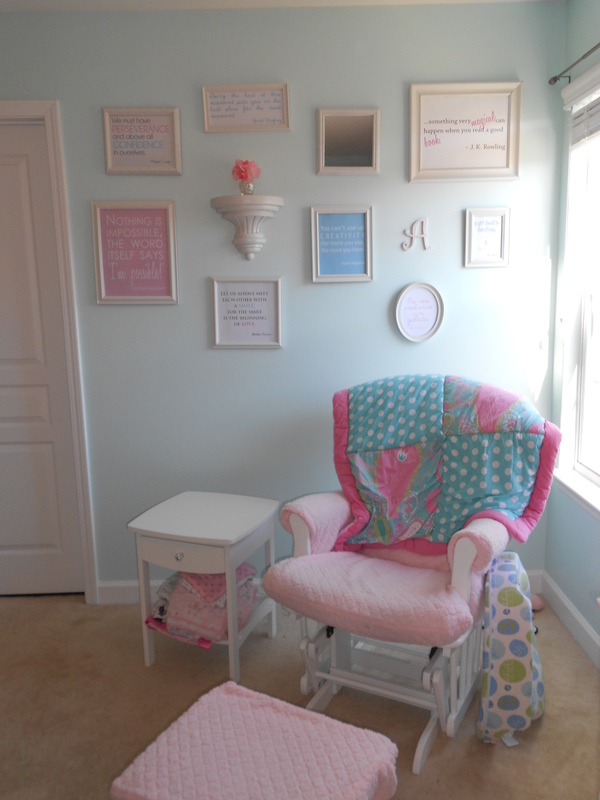 I finally got around to taking pictures and writing about our nursery. I love this room. I really do. Sometimes, during those middle-of-the-night feedings, I try to come up with ways to get my hubby to agree to switch rooms so that this could be our master bedroom. No joke. 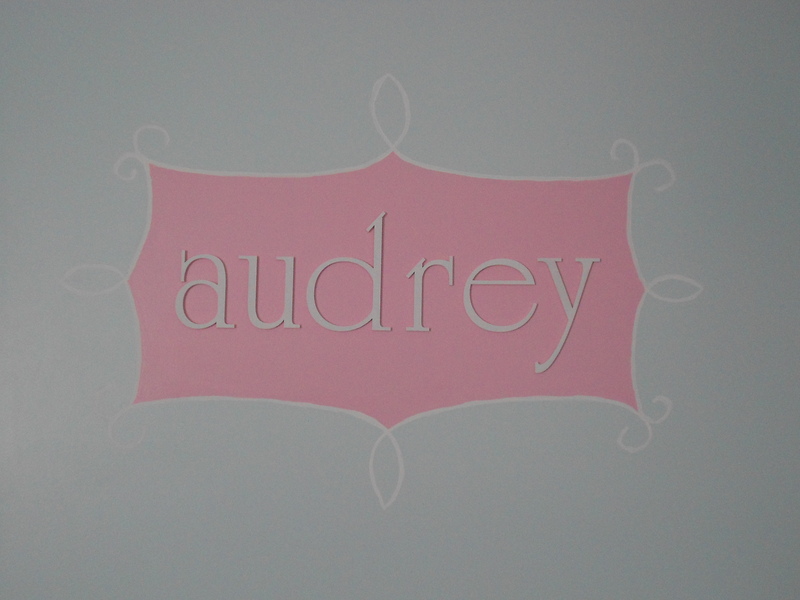 I just love the soft, dreamy aqua with shades of pink and clean white. It’s bright and fun, yet calming and soft at the same time. It’s definitely very girly but not too fussy and frilly. But I think what I like most about it is how personal it is. Everywhere I look, there’s something I made, or something from my childhood, or a reminder of a loved one. 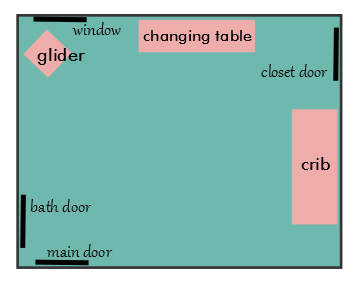 First, I’m going to do a little sketch of the layout of the room (totally not to scale). When I was looking for inspiration online, I could never get a feel for the whole room because I couldn’t see the layout. And this room is kind of weird because every wall has either a door or a window, plus an air vent that blows directly where most people would put a crib or bed, so furniture placement is a little tricky. 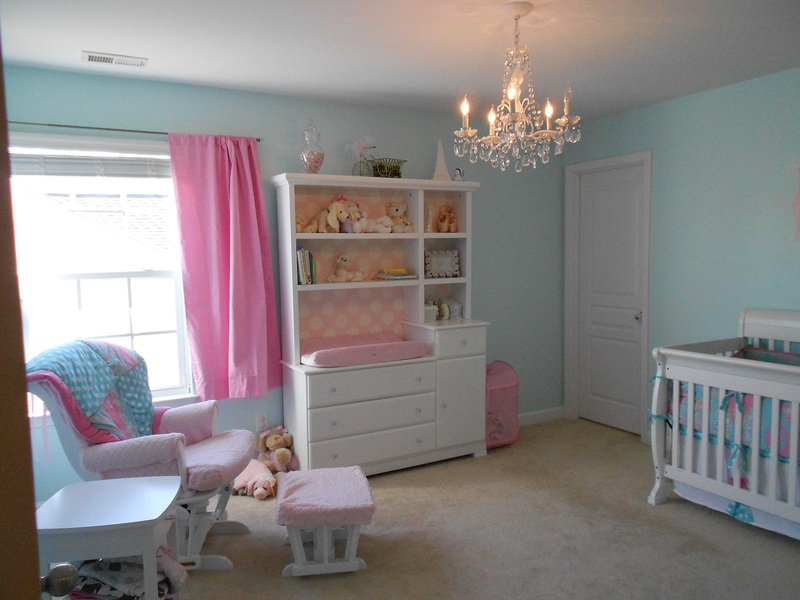 Next to the window is the changing table and hutch that I spruced up (see this post). My little girl absolutely loves it and spends her diaper changes trying to touch the dots. Let’s hope the sealer I used can stand up to baby fingernails! I filled the shelves with all sorts of things that make me smile. Most of the stuffed animals were mine, including the purple and yellow ‘hazmat’ rabbit that I got when I worked with a fire department and did a ride-along with the hazmat (über cool firefighter slang for hazardous materials) unit for a day. I also have the last pair of pointe shoes I used when I danced, a ceramic poodle that used to be in my bedroom when I was little, a little acorn that my son picked up for his baby sister on a walk, the wire bicycle that held flowers that were delivered to us when we had her, a bejeweled Eiffel tower coin bank, and a bunch of other things that make me smile, as well as the useful stuff: diapers and wipes, lotions and potions, etc. If you keep spinning towards the right, you see the crib. The poor embattled crib that barely survived my son’s teething days (cosmetically, of course. it’s still sturdy and super safe). Why didn’t anyone tell me about teething guards? The bedding was the inspiration for the room. I was having such a hard time finding anything that I liked. Everything was princess, flowers, PINK or just not right. Then I saw this and fell in love with it. It’s Pixie in aqua by My Baby Sam. I love paisley, polka dots, pink and aqua, and shazam! there it was – my favorite patterns and my favorite colors in one set. It’s like the nursery gods smiled upon my soul. Above the crib, I hand-painted a pink frame with swirly edge, hoping for kind of a parisian-ish metal street sign kind of vibe. It’s a simple design, but I am so proud of it. There was no template or guide. Just imagination, a ruler, some chalk, painting supplies and nerves of steel. Inside the frame are letters spelling her name that I got from www.craftcuts.com because I got it in my head that I wanted all lower-case letters with a serif and those aren’t sold at craft stores. I’m a font nerd, by the way. Their customer service is awesome and helped me figure out what size I needed, and even double checked with me after I placed my order to make sure that I was getting what I wanted. I decided to bypass the traditional mobile and make some pom poms in different sizes to match the room and as a nod back to the polka dot motif in the bedding. 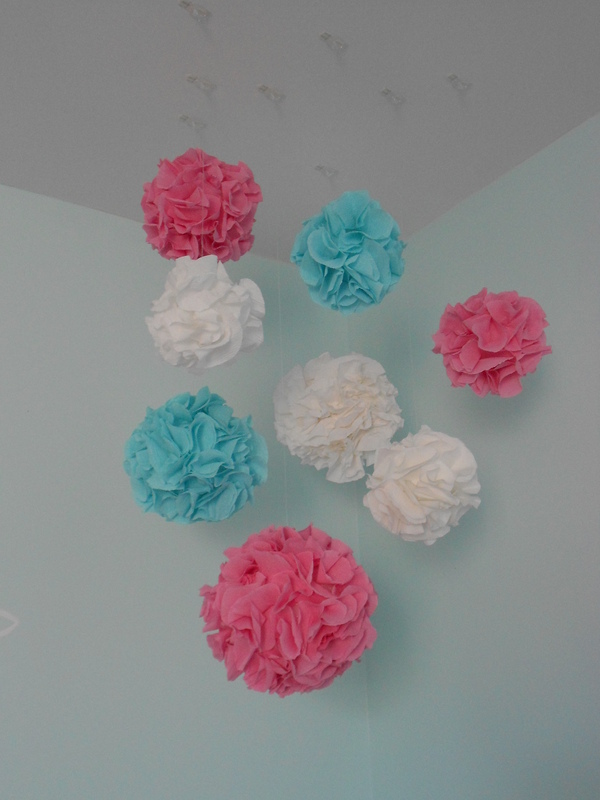 I cut about a million and a half circles folded them up, hot glued them onto foam balls and then fluffed them. I used fishing line and command hooks to hang them. The final wall is pretty bare. It has three prints of very chic ladies in some of my favorite cities in the world. I wanted to add a bit of a world-traveler vibe to the room, and loved these prints. I love looking at those during those night-time feedings and thinking back to when I visited those cities and how I hope she’ll get to see them someday (and hopefully take her mama along!). That part of the room is pretty bare right now, but I foresee there being a little art table there or maybe a ballet barre or a dress-up area there in the future. For now, the fluffy white lamb play mat will do. And that’s cool, because I love it. The final piece that I want to share is the lighting. My grandmother let me have one of her chandeliers from her house before she passed away last summer and my in-laws completely took it apart, cleaned it, replaced any hooks and wires (as well as the actual electrical wiring) that needed to be replaced, painted it and put it back together. I love love love love love it. 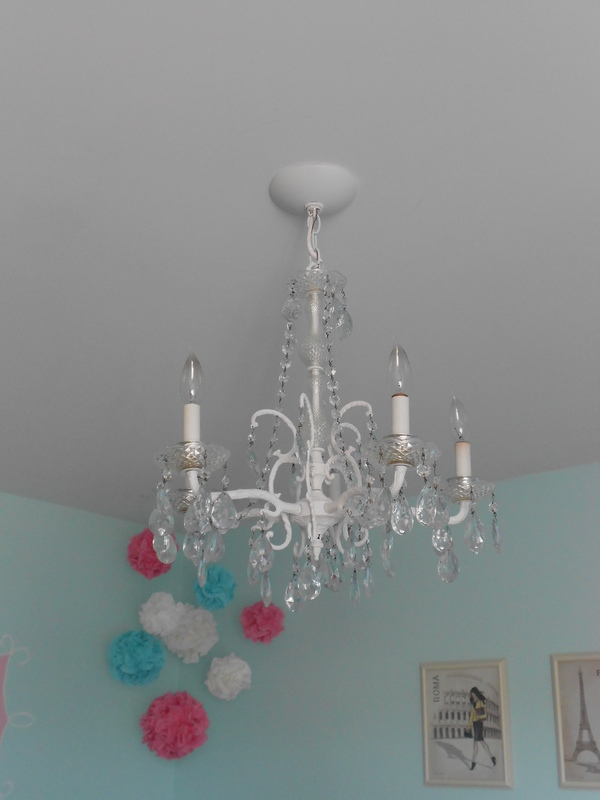 Not only does it remind me of my grandmother, but it is so pretty and sparkly and adds so much to the room. Well, there it is. My little baby girl’s room. 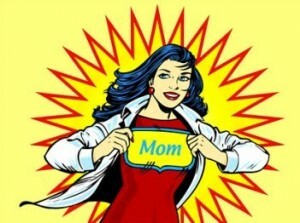 I put so much heart and soul into it, and even though she may not appreciate it, I love being in there. I still have a couple of things I want to add, and of course, things will change as she grows, but I’m pretty proud of how it turned out. This entry was posted in creativity, diy, family, home, Lil bit about me and tagged baby, decor, diy, nursery, nursery decor on February 26, 2013 by aliciamariel. It’s so simple and easy. I wrote letters on cards that I had lying around, but you can easily do it on regular paper and cut it into pieces (about four per page). I did the letters in his name and then a few others. We did this until we had collected all the letters to his name. Once we had them all, I wrote his name on the LeapPad (I had done one letter at a time before) and worked with him to put the letters in order, asking him what letter came next. It’s such a simple game, but he loved it! 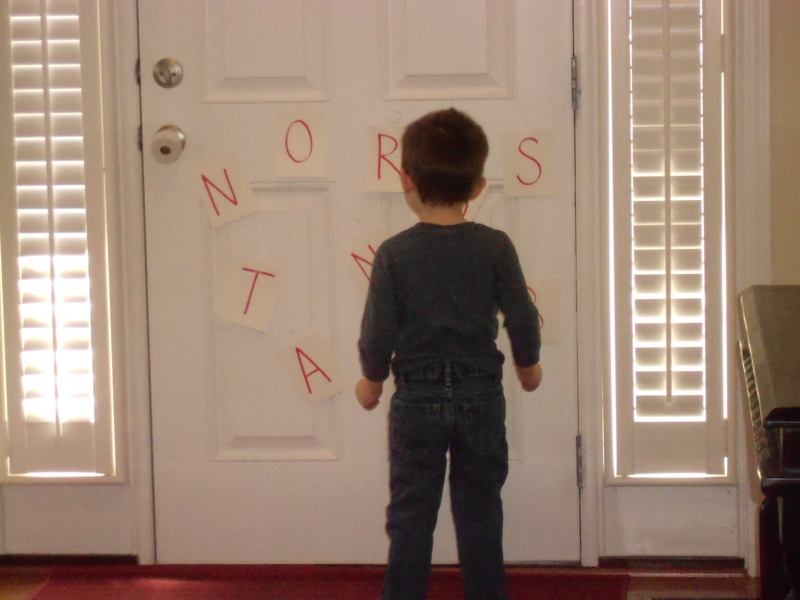 As soon as we were done, he taped all the letters back on the door and wanted to play again. This time, we didn’t even need the LeapPad. I just asked him what letters we needed, and helped him figure it out when he got stuck. He got a little upset when I had to stop to feed the baby, and made me promise we’d play after lunch. Yes, darling, I promise to make you play a fun educational game. Sheesh. When we played in the afternoon, I realized how many variations of the game there can be. I had him go to the letters in different ways (crab crawl, hopping, etc. 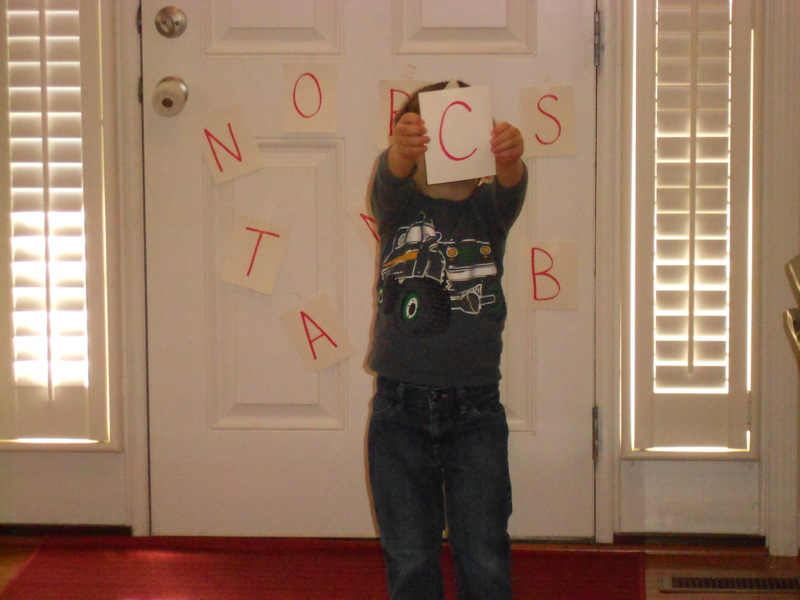 ), I asked him to match letter sounds (What letter says “Ssss”? ), I had him put the letters back on the wall one at a time… The more we played it, the more changes we could make to make it fresh. Yup. 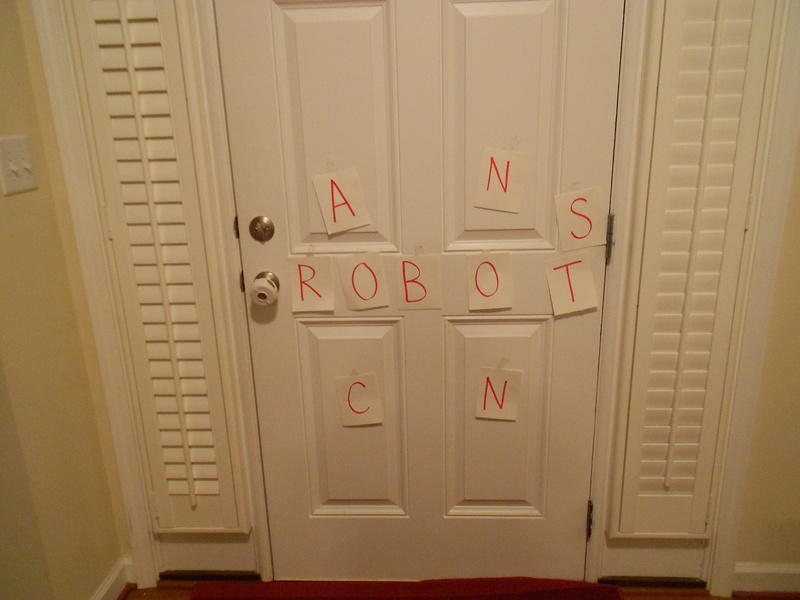 My son spelled “robot” completely by accident. He had no idea he had done that. He’s a bit of a perfectionist, so it doesn’t surprise me that he put them in a straight line in the band between the panels of the door (he’d done that a couple of times during the day), but it’s kind of creepy that he spelled out a word. All this excitement and all it took was a sharpie, some paper and some tape. This entry was posted in creativity, family, kid stuff and tagged educational games, toddler games on February 7, 2013 by aliciamariel. So my little boy has turned three years old. Wow. I cannot believe he’s grown up so quickly! I have to say, I was a little stumped about how to celebrate his birthday. Three seems to be a big year – they are finally old enough to really enjoy all the fuss, so it’s really fun to celebrate. But how? As much as I wanted to give him a real party (and had almost the whole thing planned out before the baby was born), I realized that it was too much for me to take on at the time. But I still wanted to make him a cake and celebrate. I just needed the perfect inspiration, which was escaping me. After asking around on facebook, a friend who thought I was having a party suggested setting up a cupcake bar so the kids could do whatever they wanted to do to their cupcake. And I liked the idea of him decorating the cake, but wasn’t quite 100% sold on it. Then it hit me how absolutely perfect that was. I mean, what does a soon-to-be-three-year-old want more than anything in the world? Especially one whose whole life has been turned upside down in every which way within the past two months? What my son likes most in the world right now – more than Cars stuff, chocolate chip cookies, trains and playing in leaves combined – is calling the shots, and with good reason. In the past few weeks, his whole world has been flipped about ten times over. All his friends moved to a new classroom without him, his favorite teacher left the school, he’s been potty training and let’s not forget about a new baby in the house and the constant in and out of visitors that’s resulted from that and then to finish off this crazy time, he’s moved up to the next classroom which is structured completely differently from his previous one. Just in time for the craziness of the holidays… it’s no wonder he’s trying to make everything go his way. So I ran with it. I decided he’d have as much control of his birthday as he could. The day before his birthday, he helped make his cake. Cooking is one of this favorite activities, so he was in heaven. I made it even more personalized by dividing the batter and letting him choose colors to dye the batter and then letting him fill the cake pans by pouring spoonfuls of the different colors so we got a crazy supercolor marbled cake. That night, I frosted the cake. The following day – his birthday – I set up the cake on the table with all sorts of stuff to decorate: glitter gels, Cars sugar decorations, edible dinosaur decals, sprinkles and tiny chocolate chip cookies the size chocolate chips. When he came home from preschool, he saw his birthday table and his eyes popped open wide. Just what this mama wanted. We decorated the cake while dinner was cooking (and I use the term ‘cooking’ very loosely – I popped a frozen pizza in the oven because pizza is his favorite and I’m not superwoman so I wasn’t about to cook from scratch that day). We had so much fun and he was so proud of having done up his cake. And as an added bonus, we got some quality family time in what would normally be a hectic weeknight where we didn’t really connect. What do you think of this confectionary masterpiece? This entry was posted in birthdays, celebrations, creativity, family, kid stuff and tagged birthday, birthday cake on December 19, 2012 by aliciamariel.